By Dennis W. Viau; modified from a friend’s recipe. 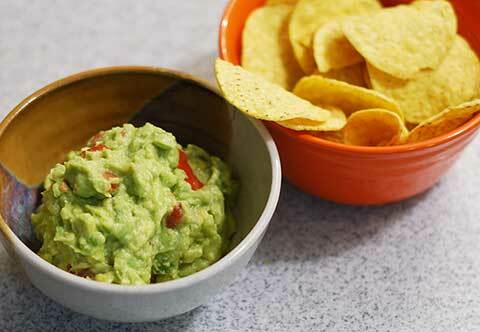 Guacamole is a delicious summertime treat, especially when avocados can be purchased at a reasonable price. Serve it with chips, spoon it onto the filling ingredients when assembling burritos, or include a generous dollop on the plate when serving flautas or taquitos. It has many uses. Cut an X in the bottom of the tomato. Pierce the stem end with a fork and immerse in boiling water for 10 to 15 seconds. Allow to cool until safe to handle, then remove and discard the skin. Cut the tomato in half through the middle. Gently squeeze out the seeds and discard. Dice the tomato and place in a large mixing bowl. Peel and dice the onion. Add to the bowl. Cut the chili pepper in half, top to bottom, and remove the seeds and white membrane for discarding. Dice the chili pepper and add to the bowl. Finely mince the garlic (or crush through a press) and add. Add any or all of the optional ingredients. Cut the avocados in half top to bottom, working around the pit and twist apart. Discard the pit. Spoon out the contents into the mixing bowl. Squeeze the juice of the lime(s) and add to the bowl. Mix the guacamole, crushing most of the avocado but leaving some chunks. If not serving immediately, smooth the top with a spatula. Cover the guacamole with plastic wrap, pressing onto the surface to eliminate the air. Refrigerate until needed. Note: This guacamole is best made fresh and served soon after preparation. It does not store well. Use within 24 hours for best results. Variations: If you prefer a smooth rather than chunky guacamole, you can crush all the avocado pieces. A potato masher would be useful. Guacamole does not freeze well if fully prepared, but a basic guacamole of only avocado, lime, and salt does freeze well. Thaw later and add other ingredients, if desired. Note: The pit does not prevent guacamole from turning brown (oxidizing). That’s an urban myth (do the research). The citric acid in the lime juice slows the oxidation process. If you believe this recipe is worth having, please consider making a donation toward this web site’s maintenance by using the following button. Thank you.